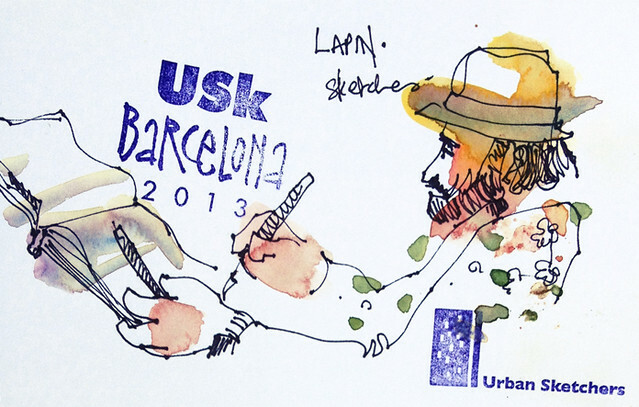 We're at the last day of Usk Barcelona already! The day began with a panel discussion with Jim, Shari, Lynne, Florian and Arno. If you take Matthew Brehm's 'Sketching Barcelona: Setup, Value and Beyond' workshop, drawing complex scenes like the one on the left will be a piece of cake. And you won't have to study classic perspective. Surely there's a catch somewhere? 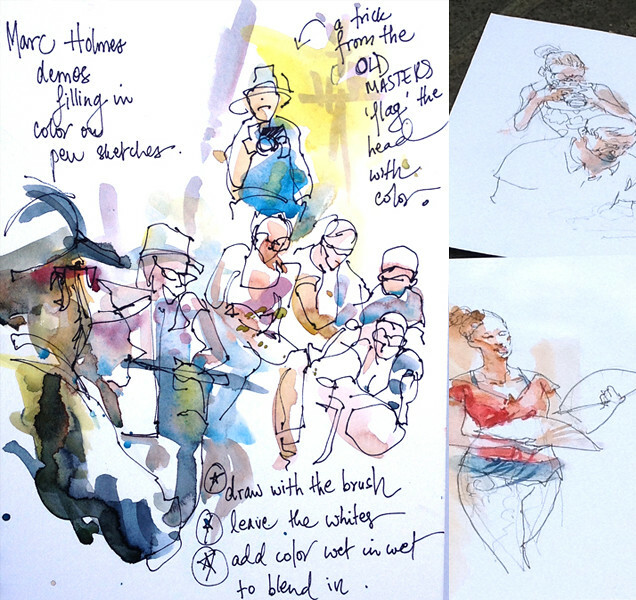 It was inspiring to see Marc Holmes demo his technique for drawing figures while keeping them fresh and alive. I sketched an ice cream shop on Rambla for the final exercise in Marc's workshop. Ever notice how kids will get their fingerprints on ANY large glass surface? These two kids couldn't be peeled away from the ice cream stall. 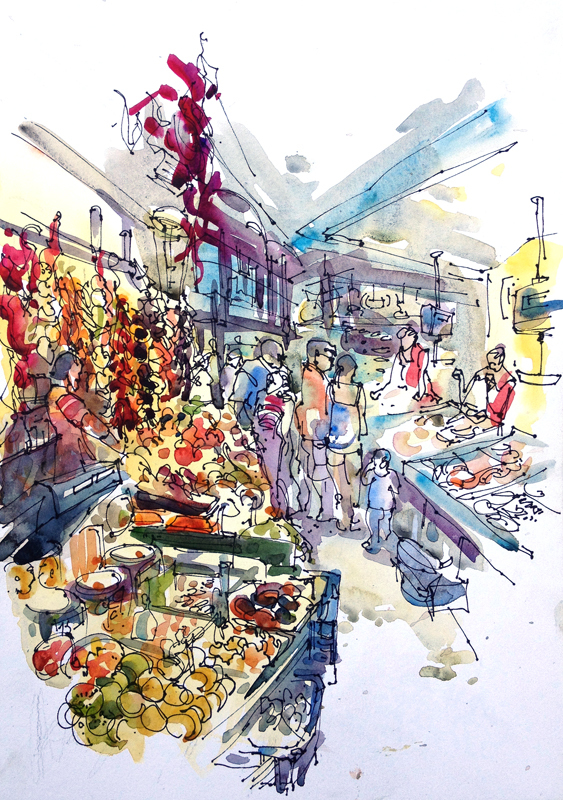 Lunch was a quick stop at a stall in the Mercado de La Boqueria, so how could I resist sketching this stall all festooned with chili peppers? 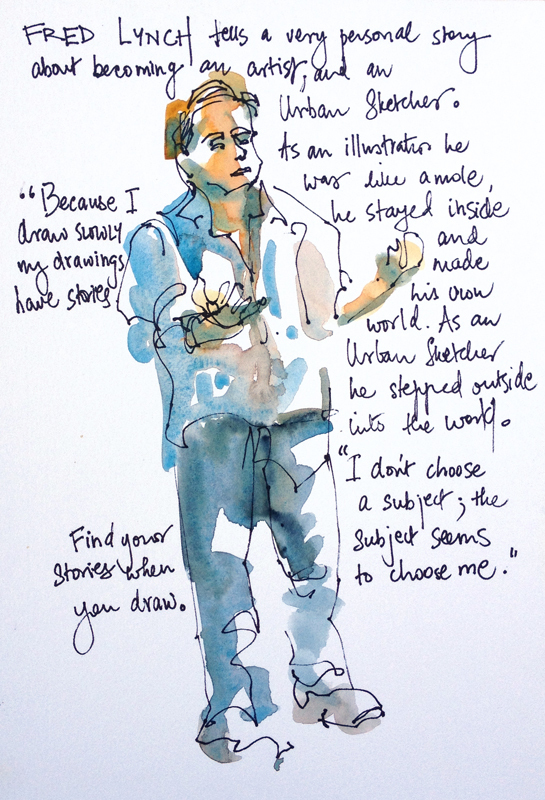 Fred Lynch' s presentation told a very personal story about becoming an artist and an Urban Sketcher. He has a great sense of humor and tells a great story. 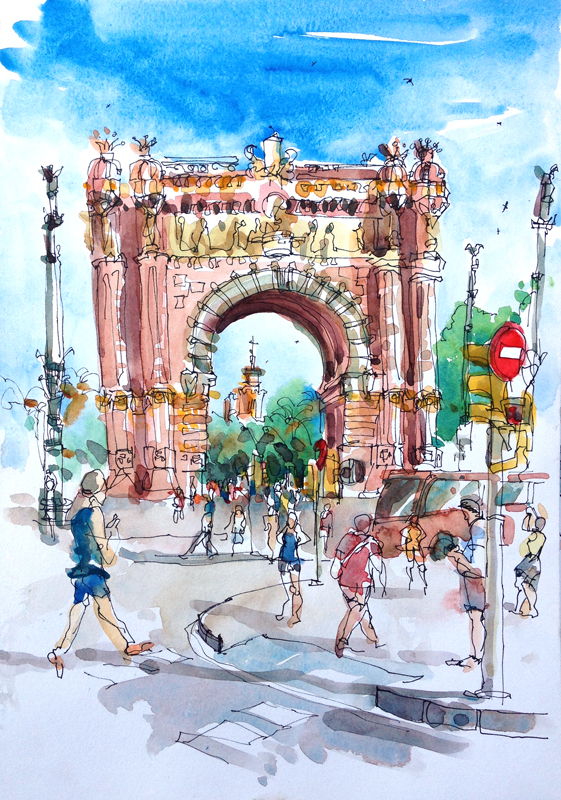 At 4pm we joined hundreds of people who had been on a sketchcrawl all day long ( for the 40th Worldwide Sketchcrawl) at the Arc de Triomf. 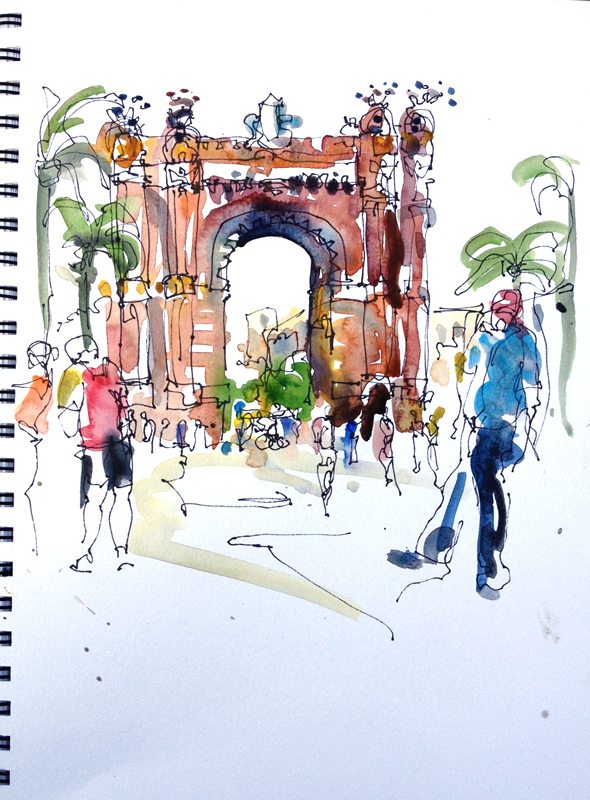 Approximately 500 sketchers posed for a photograph under the Arc before settling back down to sketch. 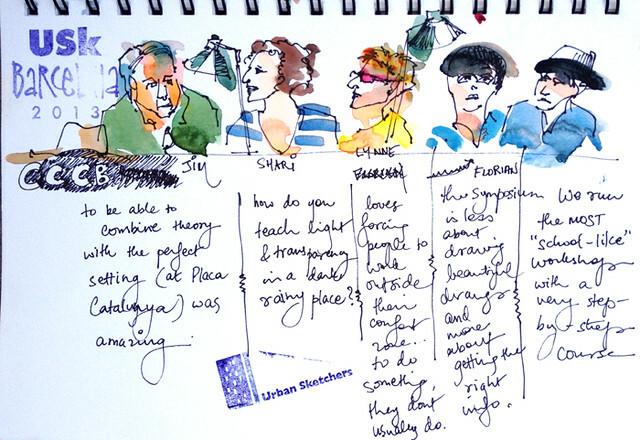 It was amazing to see a huge plaza just strewn with Urban Sketchers and was an incredible close to the Symposium. Everytime I sketch an iconic building, I have to do a few takes to get a feel for it. Here are two I did today. 3 days of back-to-back workshops. So many new people to meet and friends to make. 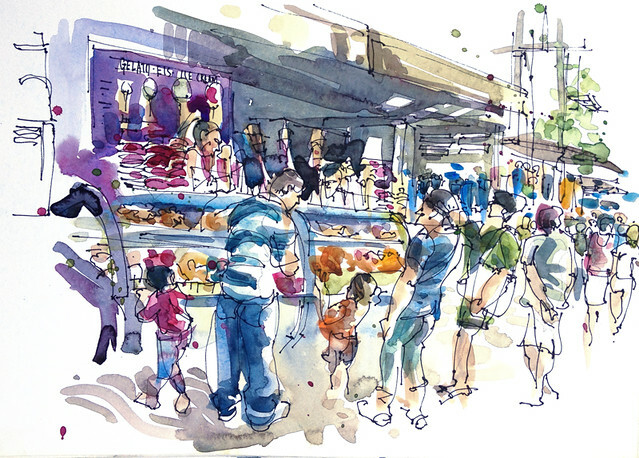 A city bursting at the seams with sketching possibilities. A group of people so crazy they will sketch all day and then relax in the evening by sketching while they drink. It couldn't get better. I'm honored to have been your correspondent for the Symposium. It was just the best learning experience and an amazing opportunity. I have so many people to thank: participants who offered words of encouragement (and detailed directions when I was lost), instructors, the organizing committee, the Barcelona team that hosted us and all my online friends that I could finally put a face to and meet in person. Thank you, Gabi. You were missed today, but you would have been proud to see what an incredible event your team pulled off. Above all, from a first-time participant and correspondent, I want to say: Lapin, I couldn't thank you enough. I will probably be very quiet on the Usk blog and fecebook page next week, but by the week, but by the week after, I'll be wondering "Where will Usk 2014 be ?" 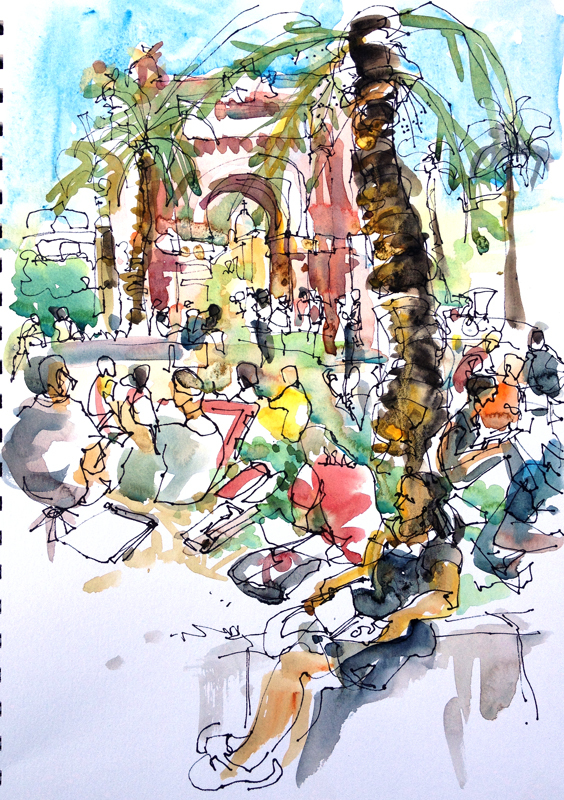 Thank you for sharing your sketches and impressions of everything in Barcelona for those of us who were back home. It looks like it was amazing! These are all so rich with the flavor of Barcelona--and what fun it was to meet you!